Igor Palmin/IN ARTIBUS Foundation Today his paintings adorn museum collections worldwide, yet there was a time when he worked part-time in art studios and spent hours admiring the works of Cezanne. Every Thursday, the young, slightly nervy (as contemporaries recall) Vladimir Weisberg walked and creaked his way around the parquet floors of Moscow's art galleries. He was not accepted into art school, so he studied drawing on his own here and there, just like his hero Cezanne, in fact. Inspired by the works of others and having dabbled with different styles, he came to develop his own, thereby becoming one of the most prominent practitioners of Soviet "unofficial art." Weisberg's youth was tumultuous: at the height of the Spanish Civil War, he attempted to flee the USSR for Spain to fight for the leftist Republicans against Franco. However, he was seized at Odessa Port whilst trying to board a ship, and sent straight to a psychiatric hospital in Moscow. His appetite for war unslaked, he was desperate for frontline action when World War II broke out. However, in the words of his friend, artist Valentin Vorobyev: "This unbalanced young man was declared unfit for war and sent to dig anti-tank ditches." There, Weisberg was again out of luck. During a bombing raid, he suffered concussion, his mental state worsened, and he was again sent to the hospital. In 1942, the "emaciated and depressed young man" (Vorobyov's words again) signed up for drawing classes, which continued during the war: "...a dozen fanatics of all ages stiff from the cold [...] shaded objects made of plaster." After the war, Weisberg tried to enroll at the Surikov Art Institute in Moscow, but was met with rejection. 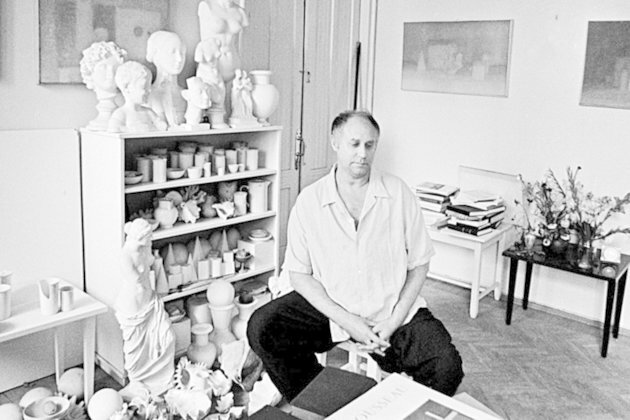 He faced many long years of wandering around the studios of Moscow's unofficial artists. He studied art technique all by himself and looked on his work with the eye of a critic. He would sit for hours on end in front of a composition until dizziness set in. Literally every millimeter mattered to him. During one such session, he decided that color was an interference and "physiologically disgusting." So he did away with it in some works, giving rise to his trademark "white on white"-nothing superfluous, just a celebration of hazy silhouettes and space. Unfortunately for him, some works demanded color. "Inside me there's a sense of truth. I can't do color. It's an eternal struggle," he said in an interview with art historian Ksenia Muratova. In 1963, critics and experts haughtily dismissed the first "white on white" as a rip-off of Italian artist Giorgio Morandi. But Weisberg most likely never even laid eyes on a work by Morandi. "The whole of Moscow rushed to see the new 'white' Weisberg," wrote Vorobyev. A master of "unofficial" art who never painted in the style of social realism with its smiling collective farmers and pumped-up workers, by the late 1960s Weisberg had nevertheless become a member of the Union of Artists of the USSR-a badge that at least allowed him to eke out a living from state commissions. On top of that, despite never receiving a formal art education, he began to teach painting. The self-taught artist's first individual exhibition took place not in his native Moscow, but in distant Paris. Alas, Weisberg was not there to witness his own triumph: the year was 1984, and going abroad was fraught with difficulties and KGB interviews. Vorobyov writes that Weisberg was wary of being probed too closely by the authorities.